New World for those who realize it is. awareness is to surrender fear into Love. What was, shall no longer be. What was not, can now become. 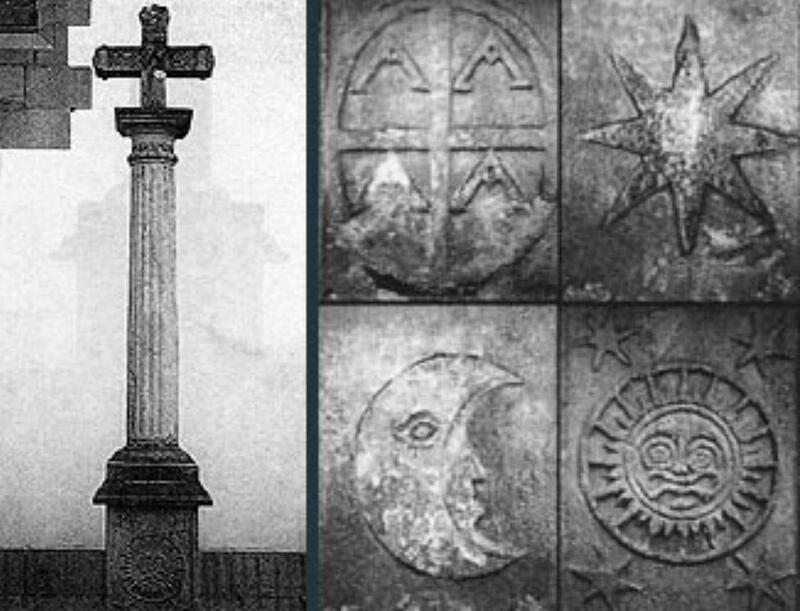 The cross in a circle, or some minor variance of this cardinal symbol, is often depicted in ancient esoteric societies, in sacred religious orders of today, in indigenous cultures, and in petroglyphs around the globe. This symbol not only represents a fundamental foundation upon which many faiths are built, but is also made to remind us, especially in times of darkness, that something profound is to occur for the entire Earth and for all of her people. For many, this symbol is a promise of an event leading to the spiritual evolutionary fulfillment of all life. The cross in a circle is not only a spiritual symbol, it is also the astronomical symbol for our planet Earth. And, the term “Holy Cross” also means “Heavenly Cross”—referring to a cross found in the heavens. The cosmic significance of this symbol is that it marks the timing of a primary transition or turning in the natural evolutionary cycle of the Earth. Hidden within this symbol is an astronomical time-piece found in a specific geometric relationship between Earth, the solar system, and our galaxy—an astrophysical event occurring now, within Earth’s ~25,000 year, precessional cycle. This section of the Lunar Planner web site presents the astrophysical geometry creating the “Cycle of Earth’s Precessional Cross”; how and when the cross forms; the greater cycle in which it occurs; and the opportunities this event provides for human consciousness. This work was first published in the “Proceedings of the IANS, International Forum on New Science, September 1995, Fort Collins, Colorado, USA. Could it be that the Urn of the Soul, the DNA, the human mould itself, is transformed into a supra-being dominated by spiritual awareness / cosmic consciousness, rather than by bio-logic’s mentalizing limits, a transformation caused by inpouring light, illumination made possible as Earth’s pole geometrically reorients in its Great Year into the divine / undivided side of the precessional cycle. Now (~2000 AD), at the occurrence of Earth’s Precessional Cross, Earth’s pole begins to lean back toward the plane of galactic light, thus crossing a primary threshold in Earth’s precessional cycle. Earth begins to retune / return to galactic awareness and the inpouring light begins to avalanche—and all of life on Earth begins its transmutation and illumination—from the inside-out. Search the Lunar Planner web site. Links available under the first Item (Earth’s Precessional Cross) go to various sections on this web page. You can use them to go to specific sections of interest or you can simply scroll down the page to explore the sections in sequence. Links available under the second item (Related Material) go to other sections or pages on this web site. The ecliptic plane, commonly referred to as the “Ecliptic of the Sun,” is created by Earth’s annual orbit around the Sun. Experientially verified by sky watchers throughout the ages, the ecliptic plane or “Solar Ring of Power” is the most significant plane in the Heavens used to map the relationship of astronomical events and their effects on Earth. This plane is a primary energy field for Earth – where occurs equinoxes, solstices, solar and lunar eclipses, and all other planetary and stellar alignments that we demonstrably experience in everyday life. The ecliptic plane is the mediating plane between Earth’s equatorial plane and our galaxy’s equatorial plane. The ecliptic plane, or solar plane, is the plane of the soul, where as Earth’s equatorial plane is that of the incarnate personality. The ecliptic plane provides the stage upon which Earth’s Precessional Cross occurs. Just as Earth nests within our solar system, so too does our solar system nest safely within the care of our galaxy. The ecliptic plane lies at a unique angle in our galaxy, tilted and nesting within our galactic plane. The galactic plane is the disc of our whirling galaxy. The galactic plane provides the greater evolutionary context for the incarnating soul participating on Earth’s experiential plane. These three intersecting astrophysical planes, the galactic plane, the ecliptic plane, and the Earth’s equatorial plane, all tilted at unique angles to one another, create the geometric orientation of the two intersecting lines or cross members of Earth’s Precessional Cross. Due to Earth’s precession of the equinoxes, one cross member (the vernal axis) rotates around the ecliptic ring while the other cross member (the galactic equatorial axis) remains stationary—creating the ~25,000 year “Cycle of Earth’s Precessional Cross.” The timing of this cyclic movement determines when the moving cross member is perpendicular to the stationary one, thus creating the perfect or erect cross. There are two erect crosses occurring in the cycle, both create primary transition points in the cycle and in our evolutionary unfoldment. One cross occurred about 12,000 years ago, the other is the astrophysical event occurring NOW (~2000 AD). The following illustration shows the movement of the vernal axis with respect to the fixed galactic axis in the ecliptic ring over the last couple thousand years—the erection of the current cross. There are three equatorial planes of three rotating astronomical spherical systems responsible for Earth’s Precessional Cross. The “Celestial Equator” (which is Earth’s equatorial plane projected into space), spins around and is perpendicular to Earth’s pole. Similarly, the “ecliptic plane,” and the “galactic plane” are also perpendicular to their respective poles. Thus one spherical system (along with their poles and equatorial planes) nests within another system. The Earth’s spherical system nests within the solar (ecliptical) system, and the solar system nests within the galactic spherical system. When we recognize these are spherical aspects of one unified cosmic order (intelligence), and that harmonic resonance occurs through the geometric relationship of these spherical systems, we can come to understand how the ever-changing geometric relationship of these spherical systems reveals an evolutionary process occurring in this greater intelligence or consciousness to which we belong. As Earth’s plane reorients itself with respect to the galactic plane during the precessional cycle, so to is Earth’s pole reorienting its angular relationship to the galactic plane. Observing the angular orientation of Earth’s pole with respect the the galactic plane provides key insight in to the nature of Earth’s Precessional Cycle and that of the “Evolutionary Cycle of the Soul” collective on Earth. 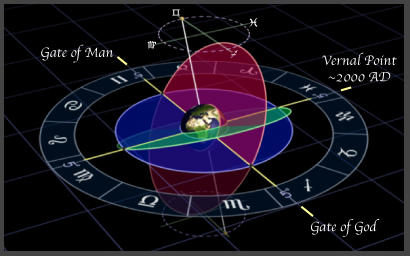 Currently, Earth’s pole lies over the same ecliptical longitude as the “Gate of Man” (the anti-GEN at 5° sidereal Gemini), which is one of the two nodes of the galactic equatorial axis. Note that the ecliptical longitude of the polar axis is always 90° in ecliptic longitude to the equatorial nodes (vernal axis). Thus, when Earth’s North Celestial Pole (NCP) resides at 5° sidereal Gemini, the Vernal Point resides at 5° sidereal Pisces. From here, as we continue in the precessional cycle, Earth’s pole lifts itself from its slumber in the plane of galactic light and the vernal axis begins its separation from the galactic equatorial axis—and cycle of Earth’s Precessional Cross begins. As we move another 90° in the precessional cycle, Earth’s polar axis aligns with the galactic equatorial axis, with Earth’s NCP aligning with the GEN (Gate of God at 5° sidereal Sag), and with the vernal point at 5° sidereal Virgo. Here, the vernal axis lies perpendicular to the galactic equatorial axis creating the “first” erect (90°) cross in Earth’s Precessional Cycle. Note also that Earth’s polar axis begins to lean away from the galactic plane of light (marking “The Fall” from Unified Awareness), and which begins a 180° (~12,000-year) period of temporal darkness. Thus, “The “Fall” occurred about 12000 years ago. As we move another 90° in the cycle, as the NCP moves to 5° sidereal Virgo, Earth’s polar axis tilts furthest away from the plane of galactic light—the furthest point of separation from Source / unified awareness. The cross members (vernal axis and galactic equatorial axis) reverse and collapse at this point, with the vernal point on the Gate of Man. Here we are a the midpoint in the 180° period of temporal darkness, which started at the first (90°) cross and which ends at the second (270°) cross. This occurred about 6000 years ago (circa 4000 BC). Moving another 90°, we return to the spherical geometry occurring now in precessional cycle, with Earth’s pole lying over the “Gate of Man” (the anti-GEN) and the vernal point at the 5°sidereal Pisces, creating the “second” (270°) erect cross in Earth’s Precessional Cycle. Notice also that at this point, Earth’s pole beings to lean back toward the plane of galactic light—beginning our re-illumination in consciousness—our return to the galactic field of unified awareness. Thus we are now leaving the last 12,000-year period of temporal darkness and entering a period of re-unification, where we begin to awaken to galactic or unified awareness. See the Star Chart of the Heavens to see the galactic equator, ecliptic, celestial equator, their poles and the Primordial Origin as they reside against the stars in the heavens. See Earth’s Precessional Cross Movies for an animation of the above. The revelation of Earth’s Precessional Cross transcends the past and the future, uniting the esoteric teachings of ancient secret religious orders and the quantum science of today’s world. Why this cycle, and the erect cross occurring now within it, is of such importance to us all, is found in the quantum principle that matter, energy and consciousness are aspects of One Unified Creative Intelligence. Cosmic energy is, in fact, “Evolutionary Intelligence” that is responsible for the unfoldment of this Universal Consciousness of which we are intimate parts. Subtle cosmic energy translates from one astronomical system to another through geometric resonance occurring in interacting spherical rotational systems. For this reason, and for additional reasons elucidated in this work, it becomes clear that the Earth’s Precessional Cross is catalyst for a tremendous acceleration of change on Earth. As we delve into a deeper exploration of the entire Cycle of Earth’s Precessional Cross, we come to see how primary geophysical events are governed by specific transition points, or phase changes, occurring in this Great World Cycle. The Great Flood is but one example. The Great Flood is said to have occurred around the last, but reversed, precessional cross, circa 12,000 years ago. In this exploration we can see how this cycle defines the tides of human experience—those that destroy civilizations, as well as those that create cultural renaissance and rebirthings in consciousness. The more we examine this dynamic astrophysical geometry, the easier it becomes to acknowledge it is the underlying timepiece governing our Earthian experience. The phase transitions occurring within the Great World Cycle create an intelligently ordered progression of evolutionary unfoldment in consciousness—an evolutionary spiral supporting the maturing and spiritual fulfillment of incarnating souls. This evolutionary spiral occurs in the relationship of the astrophysical and gravitational vectors that determine our temporal experience as durative and evolving souls participating in the spiritual unfoldment of Divine Intelligence. The precessional orientation of Earth’s polar axis with respect to the galactic plane reveals exactly where we are in this unfolding spiral in consciousness. It defines the timing of this cycle. The occurrence of Earth’s Precessional Cross now marks a primary phase transition in this embracing precessional cycle. This specific cross creates a paradigm shift in Earth’s natural evolutionary unfoldment of consciousness. As Earth’s pole now re-orients back toward the galactic plane, and the precessional cross becomes active, it marks the time where we return from 12,000 years of temporal darkness, from our experience in duality consciousness, from the separation of the fallen feminine and masculine principles, to a re-unification in consciousness—where emerges the Divine Feminine and Divine Masculine principles on Earth; and where we can now demonstrate the Divine Union of the feminine and masculine, both within our selves, and in our relations with each other and with all of life. This transition has just begun, ~2000 A.D., and so too our return journey into unified field awareness. The time leading into this 270° transition point in the cycle creates an “inner need to change,” and the time immediately afterward is one of “initiating change”—which we are now in. Nested within a geometry of rotating astrophysical spheres of Cosmic Intelligence, Earth’s precessional cycle governs the “Evolutionary Cycle of the Soul”—a natural cycle that directs the spiritual unfoldment of Earth’s entire soul collective. This occurs in the underlying fabric of matter, energy, and consciousness, catalyzing an unprecedented change in souls’ incarnate experience. Approximately twelve thousand years ago, at the previous erect cross, (and at the time of the Biblical Flood) the pole of the Earth in local space began to tilt away from the Galactic Plane—away from our source of illuminating light. At that time we began a 12,000-year period of temporal darkness—apparently separate from the unified galactic awareness. For the duration of this time, humanity experienced a tormenting shear within the masculine and feminine principle—without the embracing awareness of the illuminating plane of galactic light that naturally underlies these two entwining facets of our perceptual world. Now, with all souls having experienced both sides of duality’s paradox, a reunification in consciousness begins where the Divine Feminine and Divine Masculine principles re-establish their natural harmony. This can only occur now as Earth’s pole geometrically reorients (tilts) back toward the illuminating light of our majestic whirling galaxy due to the Earth’s precessional cycle—as human consciousness reorients back into the Unified Field of Divine Love. A question I am sometimes asked is: If this magnificent transition is occurring and the world is evolving spiritually, why is our world in such turmoil – it looks as if we are going backward? This is a natural occurrence. Why? In advanced healing work we learn about a process called a “Healing Crisis” (Dr. B. Jensen; Dr. JW Ray; et. al.). As we increase the vibrational resonance of the body, that is, cleanse it and supply its required nutrients (as one step), we create a refined vibrational environment within self, basically cleaning up and harmonizing our “biological terrain.” In doing so, a more functional neurological resonance occurs. At this time, that which is of a lesser resonance surfaces to consciousness as our organs of weakness begin to throw off lower-order patterns (the mental, emotional, and physical patterns stored in our cellular makeup). During this healing process, our organs of weakness become acute as if in major turmoil before relaxing into their new and more refined state of vibrational function. It can appear as if something is very wrong if we are not aware of this natural phenomena. Often time, people are taught to suppress this natural healing process (something synthetic drugs do) which creates more chronic degenerative conditions. Knowing how to induce and support a healing crisis allows us to move through it harmoniously and arrive to a refined state of health, function and vitality. This very same intensification of conflict , a “healing crisis,” is occurring in our world as we make passage through the Earth’s Precessional Cross portal. Unfortunately, most people do not know how to embrace and harmoniously move through a healing crisis and make the personal metamorphosis. Instead many become lost in it, only to make the drama worse. As we begin to experience the dissolution of separateness and estrangement between personality-egoic-level self and our Divine (undivided) soul-level-Godself, so too does the mental, emotional and physical patterning, that we, as incarnating souls, as a world, have incurred throughout the entire 12,000-year temporal period, surface within our consciousness in an intensified and perhaps dramatic “healing crisis.” This provides each of us with the challenge to heal and clear all that we have carried for lifetimes of having been on one side of the fence or the other. As this shift dislodges and dissolves the conflicts of consciousness crystallized within self, we are forced through many contortions and paradoxes that often leave us consumed in our inner turmoil and its surface turbulence. In this process, some will willingly relinquish the inner conflicts of the past surfacing from cellular memory and embrace a new awareness, while others will become tormentingly lost in the dramatics of the healing crisis, playing out their inner conflicts to the bitter end, but ultimately we are all on the same road Home. The easiest way to facilitate this process is to unconditionally accept, without judgment, all that we experience in our lives and all that we feel surfacing within ourselves moment-by-moment. Simply speaking, this is the principle of Unconditional Love—the acceptance of all conditions. Easier said than done? There are many tools to aid us in this process. Daily meditation and other techniques of clearing the emotional body on a regular basis can aid us tremendously. Ultimately, these tools teach us how to surrender into the Zero-Point of LOVE. As we pass through the Earth’s Precessional Cross portal, we either remain entrapped in FEAR—dramatizing in our lives the mental-emotional monsters within ourselves, and the resultant “need to control” the world around us, or we surrender into LOVE by choosing unconditional acceptance of all that we have been and of all that we currently experience no matter how dramatic it is. Ultimately, unconditional LOVE is a moment-by-moment CHOICE. Embracing the barrage of emotions surging during the healing crisis in unconditional acceptance is the easiest way to release the crystallized patterns carried in the cellular structure and to have the resultant revelations in consciousness that the impouring light is offering—to be willing to feel without need to re-act. Wholistic ways of living can facilitate this transition as well, from the types of food we eat to the environments we live in. Staying centered, grounded, and connected to the Earth is essential to harmoniously integrate the phenomenal influx of cosmic energy that is catalyzing the spiritual awakening of human consciousness. By attuning ourselves to Earth’s natural resonances and cycles, we attune ourselves to our durative, everlasting selves—to that which transcends the surface turbulence of our rapidly changing lives. & Towers Across the U.S. Synthetic drugs, clothes, and environments constructed of non-organic materials and disproportionate geometries also have a negative effect that suppress our emotions and our ability to breath with the unfolding cycles of life and which maintains the crystallized patterns we hold in our cellular makeup. When we are not willing to experience, we feel physical pain (which is an emotion). When we suppress pain (or any other emotion)—in any variety of ways—we push ourselves down-scale vibrationally—down the emotional scale (from enthusiasm, into pain, anger, fear, grief, apathy, unconsciousness, and degenerative death). When we are willing to embrace emotion in unconditional acceptance, we move upward through the emotional scale (unconsciousness, apathy, grief, fear, anger, pain, to enthusiasm). When we are willing to feel (unconditionally embrace) one emotion, we move up to the next until the underlying pain (resistance to past experience) that we hold surfaces. When we are willing to embrace the pain, the pattern releases, the pain dissolves, and cellular and molecular recoding occurs. This is how to move through a Healing Crisis. When this recoding occurs we can draw (create) new experience based on the new subtle-energy patterns we radiate from our cellular makeup. If we do not clear the pattern by moving through the entire healing crisis, by getting to the suppressed pain, we continue to draw experience reflecting the pattern we are holding. Once we learn this process of unconditional self-love, we can live it moment-by-moment, thus integrating experience from a place of personal empowerment rather than continuing to build a psychic battery of suppressed trauma. As stated, many people have been taught to suppress emotion or to project it outward (in blame) on others or on life’s experience rather than to embrace it and own it as their own. Once the body learns the reverse process, the way to move through a healing crisis properly, it becomes a natural way of life. The healing crisis can occur rapidly or over a longer period depending on our personal cycles. Antiquated patterns overlaid upon patterns are emerging at an increasing rate during this phenomenal evolutionary transition. Learning to allow the movement of energy within self through the process of unconditional acceptance (Love) is the way to the place within the heart that most of us seek. To go to a place of Love is to choose Love. To choose Love is to tip the scales so our dreams become real. E-motion (pain) is the resistance to the motion (the movement) of experience through our bodies. To become a light body is to release our resistance to the experience of life. When we have no more resistance, we super-conduct consciousness and illuminate. To illuminate is to embrace the totality that we already are. The occurrence of Earth’s Precessional Cross transcends, supersedes and embraces all other planetary cycles occurring for all of humanity. No one on Earth is exempt from this evolutionary opportunity. The many year period building up to the current erect cross, brought an “Inner Recognition of the Need to Initiate Change.” Now (at the turn of the millennium), as we are squeezed through this portal into the next phase of Earth’s evolutionary cycle, we “Commence Radical Change.” This change could only begin now, and is one that will continue to take form over many years ahead. But now, with conscious deliberation, a choice must be made: to either relinquish a lesser mode of participation willingly and move to a new vibrational modality of experience, or acquiesce to ramifications of denial and be tilled with the soil in a cataclysmic turning. Earth’s Precessional Cross provides opportunity to shift into unified co-participation as One World, honoring the uniqueness of our diversity beyond the judgments and conflicts of duality, and to graduate from our isolated and quarantined Earthian experience into galactic awareness and extraterrestrial majesty. Despite my emphasis that Earth’s Precessional Cross is occurring NOW and this evolutionary transition is about living in the present, I am often asked exactly when the transition actually occurs. However, I believe that to answer this question in terms of Earth time is merely academic. We like to think in terms of things occurring at a fixed point in time and space, as if we are moving in a simple circle where we return to some point (in space) at some specific time as if we are hands on a clock. Instead we might consider that our fixed point of attention is spiraling through a fast field or continuum of space-time with many factors involved that are also changing, and most likely in ways we may not be aware of. In simple terms, the Precessional Cross is a mappable astrophysical transition occurring when the vernal point is exactly perpendicular to the galactic equatorial node (GEN) (the Gate of God). This exact square “appears” to occur in 1998 ( ~July *). The December solstices occurring around the time of the exact cross cause the solstice sun (which is exactly square the vernal point) to lie upon the galactic equatorial node. * Attempting to define this event to an exact time, month or day, perhaps even in a specific year, is merely academic for several reasons. One is that the galactic plane is not merly a thin line like one woud draw on paper. This line is merely drawn as a frame of reference. It does not mean there is some actual shift in mass, quantum flux, or any other energetic shift as we cross this line. The plane of our galaxy is not a thin line, it is a thick and complex band of billions of stars and energy. There are more reasons below. The December Solstice Sun lies exactly on the Gate of God (the galactic equatorial node) when the vernal axis is exactly perpendicular to the galactic equatorial axis. In addition to the potentially many unknown factors involved that make reducing the occurance of the Precessional Cross to an exact moment (and the Solstice Suns’ alignment with the galactic equator), many years pass while this alignment moves just a fraction of a degree as shown in the illustration below. Thus our experience of this transition is stretched over many years in Earth time. Consider also that this event occurs in a spiraling vortex of evolutionary time, and the translation of this event stretches and expresses through a series of interweaving astronomical cycles—cycles that articulate this precessional moment. Thus, we are not waiting for some calendarical event to occur, we are in this evolutionary portal moment-by-moment—NOW. The choices we make moment-to-moment in our daily lives determine the nature of our passage—whether it is one of tragedy or one of harmony. Although it seems we are still, physically not moving, (like when we are sitting in a chair for example), we are actually rapidly moving, rotating around Earth’s pole. A location on the surface of the Earth at the Equator is whipping around the Earth at approximately 1000 miles per hour. This speed is a function of the circumference of the circle, thus changing with Earth’s latitude—one of the reasons time seems to be different depending on latitude at which we live. In addition, Earth is rotating around the Sun, another larger circumference, moving at about 108,000 km/hr (67,000 miles per hour). And as Earth is speeding around our Sun, the Sun is also moving through space, (called a star’s proper motion) estimated to be moving at about 720,000 km/hr. Thus, although it appears we may returning to some fixed point in our yearly cycle, this is not true because as Earth rotates around the sun, the sun has moved at a tremendous rate to an entirely new location in space—into entirely new interstellar environment. Since one cycle rides upon another cycle, each cycle is actually a spiral not a circle—an evolutionary spiral in an ever-changing but unified field of consciousness. This spiraling effect is especially true regarding our very long precessional cycle. Thus we are faced with translating an event, one occurring in an entirely different plane of reference—in a far vaster or more transcendent spiral occurring in consciousness, into Earth time (based on Earth’s rotation). In doing so we make the assumption that this much broader transition precipitates in some Earthian moment. Does it? Academically yes, experientially no. To translate this precessional event into Earth time is a simplification and a relative statement, merely a Mercurial attempt that makes it possible to talk about it. There are many other factors to consider that we are aware of as well that may alter our experience of this “moment.” For example, Earth is not merely a solid ball spinning in space. It is a complex gyroscopic system, with an outer spinning shell floating upon a core spinning at a different rate. There is also more than one pole, the rotational pole and the magnetic pole, shifted upon one another. We are measuring this transition from a mere visual observation based upon the vernal point’s location from Earth, as if it were a simple sphere—again a simplification. Waiting for something to occur that is outside of self, whether it is a future date, like the Gregorian 2000 A.D. transition, or like the Mayan calendar 2012 prediction, or any event, like the return of Jesus, the arrival of extraterrestrials, or some global transition, like the end of the world or a golden age of light, I believe, is to totally miss the message that Earth’s Precessional Cross offers and the opportunity it provides. This opportunity is our personal metamorphosis in consciousness, a process occurring in the NOW, moment-by-moment. This is what we are doing here as evolving souls on Earth, an underlying commonality for us all, independent on how we see or articulate major evolutionary transitions, or their cause. Our personal metamorphosis happens from the inside out, not from the outside in, just as physical healing occurs. To invert the externalized mind set (arguing belief structures), where we say, “when things change outside of my self than I will change” is to mature into an internal awareness where we take personal responsibility for our spiritual growth and evolutionary experience. Here we realize we co-create our reality—from the inside out, moment-by-moment. In this internal awareness, we no longer place blame for our misfortune on others or on events occurring in our lives, nor do we wait on blessings to come to pass, for something outside of self to save us. Here we unconditionally embrace our experience, breathe it, integrate it, digest it, and re-express our creative wisdom gained from our integrated experience from a place of inner peace, stillness, and love. This step into the NOW is our opportunity. It is to take responsibility for our evolutionary unfoldment, our spiritual awakening, the return of Christ Consciousness, Galactic Awareness, Soul-level Awareness, Unified Field Perception, or whatever one wishes to call it. As conveyed above, we are at the 270° point in Earth’s precessional cycle, This harmonic transition point in our evolutionary cycle, the erect cross occurring now, has a similar characteristic as the last quarter moon in the lunar cycle. It is the “turning” that creates an “inner need to initiate change.” In the agricultural cycle, this is where we plow under the crops and prepare new ground. Here we relinquish the stage setting we participate upon, to step from the facades and masks we hide behind, and look at and reveal our true selves, and embrace our commonality, our essence, our primordial spiritual origin. It is the resistance to this relinquishment and need to change that humanity currently fights. Fighting against this natural evolutionary transition is that which creates our current turmoil on Earth. Relinquishment of the false barriers, the externalized beliefs (manifest as political, religious, and financial structures) that perpetuate separation an subsequent anarchy is essential for us to make harmonious passage through this evolutionary portal. However, to assume this is going to occur in an instant or that all people will by some miracle acquiesce is, in my opinion, naiveté. More likely, many will continue to defend their separatist beliefs to a conflictual crisis point. As always the inner creates the outer and in this case our inner conflicts express as the conflicts in our external lives, even for those who do not realize this natural law. There will be some people who embrace their experience and resolve their inner conflicts moment-by-moment and create a harmonious change in the world, and there will be those who continue to defend their separatist beliefs / inner conflicts and dramatize them as discord in the world—the epitome of separation. The choice, as always, is ours. Another question I am often asked is: Does Earth’s Precessional Cross and Mayan Calendar 2012 date correspond? The erect cross, which creates a principle harmonic transition between the earth (human level consciousness) and our galactic plane (galactic level of consciousness), which centers “around” 1998, and which I suggest is one primary indicator of a major “turning” in our evolution of consciousness, is very close to the time in which we enter the “galactic underworld” / “galactic creation cycle” of the Mayan calendar (1999) (and a calendar end date on October 28, 2011), as presented by Carl Johan Calleman. Is this specific correspondence happen-chance, or truly synchronistic, I do not know. It is simply an observation. The work of John Major Jenkins reveals the December solstice of 2012 to be the end date of the Mayan Calendar, also the date popularized in the media. Keep in mind that the rate of precession is such that there is but a mere 0.166…° orb from 2000 to 2012, the latter date considered the pivotal transition point of the Mayan Calendar. To put this into perspective, if Earth’s precession occurred in one Earth day, 12 years would be equivalent to 45 seconds. So in practical terms rather than academic terms, the 2011 / 2012 Mayan calendar dates are a few breaths away from the actual precessional cross—and I re-emphasize the many unknown factors about how the precessional cross propagates into the Earth’s complex gyroscopic system as presented above. NOTE: There seems to be miss-information circulating that references my work on the mapping of Earth’s Precessional Cross, along with the subsequent solstice Sun occurring on the galactic equatorial node (GEN) Gate of God, which occurs at the time of the cross (as I present above), saying that this ONLY occurs in 2012. In actuality, the solstice Sun conjoins the Gate of God over a many year period within a very small orb due to Earth’s very slow precessional rate. Earth is spherical receiver / transmitter. Earth’s core receives cosmic originating “Evolutionary Intelligent Instruction” through the “Earthgrid Activation Sequence.” Earth re-radiates this intelligence, translating it into radially distributed gravitational waves—long waves that emanate from Earth’s core outward toward the surface. The cosmic information is encoded within these extremely low frequencies that express from Earth’s Core—why our need to stay grounded. The human spinal column is a tuned antenna that resonates to and receives Earth’s gravitational emanations. These vibrations culminate in the cranial structure that reflects them to the pineal gland in the center of the brain. The pineal gland is a “neuroendocrine transducer” that converts Earth’s gravo-magnetic signals into chemical hormonal responses that control, via the Hypothalamus, the pituitary gland. The pituitary is the master control center of the brain that governs the rest of the neurological system. This information expresses into the cellular structure of individual—essentially into the molecular matrix of the cell in a “DNA Illumination Sequence” that is responsible for our evolutionary awakening. The pituitary is the administrative seat controlling cellular memory, and hence, the remembrance / emergence of our true selves. The DNA is a double-banded molecular helix (a spiraling ladder) comprised of a hydrogen-bonded, phosphodiester (light-bearing) lattice (circuitry) that literally translates cosmic intelligence into human expression. The DNA is the “Urn of the Soul”—the vessel through which soul expresses. The coding of the incarnating soul overlays upon the genome (human coding) held in the molecular matrix of the DNA, giving soul a palpable form of expression. Ideally, I propose, the DNA molecule is intended to superconduct consciousness in a way that illuminates the genetic urn, much like a light bulb that illuminates when electricity passes through its filament. When the bulb is on, we see light radiating from the bulb, when it is off, we see only the unillumined filament (circuitry) within the bulb—and are left in darkness. Our current view of the DNA molecule is of its un-illumined, double-banded, skeletal structure—of just the circuitry. In the non-illumined genetic state, our DNA conducts consciousness but minimally, with consciousness bouncing in a reflective nature, trickling through the genetic lattice. This impeded flow of consciousness results in the bio-logical mode of reason, resulting only in the ability to compare opposites, mirror-image perspectives within our own perception—in essence, to be able only to reason our way through life. This is why we perceive a dualistic world of shadow and solid form—the reflection of the expression of our own consciousness. This is also why our human patterning dominates and aberates the expression of our true soul essence, as we frustratingly struggle to express our full potential that, despite our yearning to be somehow more that we are, seems endlessly held in check. This is also why we degenerate and prematurely die. When the pole of the Earth tilted away from the plane of galactic light, circa 12,000 years ago, at the first, 90° precessional cross, incarnate souls began to experience the fall from light. At that time, the DNA helix dimmed, ceasing to pass Soul Essence Light, resulting in 12,000 years of temporal darkness. The 270° precessional cross occurring now, circa 2000 A.D., marks the return from temporal darkness into the divine half of the cycle, where the re-unification of consciousness begins. At this time in Earth’s precessional cycle, as Earth’s pole re-orients back toward the plane of galactic light, the Earthgrid Activation Sequence begins to shatter the crystallized shadows within our cellular makeup that were created by our past, un-integrated, incarnational experience. The relinquishment of this tension (resistance to experience) held in our cellular matrix allows a relaxation and reorientation to occur in the light-bearing circuitry of the DNA (in the atomic moment of hydrogen). The DNA in turn begins to superconduct consciousness. An eventual avalanche of consciousness through the genetic urn literally illuminates the skeletal lattice of the DNA into one, radiant, unified spiral of light. As this occurs, our bio-logical modality of comparison (judgment) ceases, and we begin to participate from “Unified Field Awareness.” In this new, bio-illumined mode of awareness, we see beyond the conflicts that were inherent in the un-illumined, dualistic, bio-logical mode of the DNA—beyond the shadow cast upon our mortal eyes. We become unified with the truth of our Goodness / Godliness as Illumined Beings fully aware in the wisdom of our Divinity (undivided nature). Thus, the illumination and re-awakening of human consciousness occurs in a time-locked process synchronized with Earth’s precessional cycle. The “Astronomical Earthgrid Activation Sequence” and the “DNA Illumination Sequence” comprise one entwined spacetime sequence of evolutionary unfoldment. Earth’s Precessional Cycle governs the “Evolutionary Cycle of the Soul”—the evolutionary process of the entire soul collective on Earth. Unimpeded reception and integration of Evolutionary Intelligence is essential for the harmonious awakening of human consciousness—for the fulfillment of our evolutionary destiny. Living in attunement to Earth and her natural astronomical cycles is so important because we integrate our Greater Cosmic Intelligence as it re-expresses from the core of Mother Earth. This is why living in conscious attunement to the Lunar Cycles and other astronomical cycles as taught in the Lunar Planner is of such value. It is one of many things that we can do to ensure a harmonious transition throughout this unprecedented evolutionary portal occurring in the cycle of Earth’s Precessional Cross. The evolutionary process of human consciousness is inseparable from the Astronomical Earthgrid Activation Sequence described above—it is one interactive, intelligently ordered, evolutionary system. I stress this point throughout this work and the need for the attunement of human consciousness with the Earth. Living in this atunement is to have respect for our selves and for the Earth; and by doing so we significantly contribute to the establishment of a Love-based Earthgrid resonance—one supportive to a harmonious evolutionary transition. In fact, it is our global responsibility, as stewards of the Earth, to tip the scales to create an overall grid-resonance of LOVE—rather than allowing one of FEAR to perpetuate. When we honor that human consciousness is a resonant shell around the Earth that contributes significantly to the overall harmony of the Earthgrid, it becomes easy to acknowledge our conscious state to also determine whether the Earthgrid harmoniously integrates the influxes of cosmic energy when activation windows open. Thus, we have an intimate role in determining the nature and extent of seismic activity—as well as all cataclysmic “acts of God.” If we are discordant with the natural resonances of the Earth and her cycles, and are resistant to integrate the very energy resonances supportive to our own evolutionary unfoldment and fulfillment, we essentially are attempting to isolate ourselves from life itself. As we do, we atrophy, crystallize and eventually, we seismically shatter in crisis. To establish a Love-based Earthgrid resonance is to surrender resistance to experience, and to surrender judgment of ourselves for our all of our human experience. To unconditionally accept our humanness while we simultaneously act to better our human condition is a form of communion, an act of Love that creates a condition of geophysical and cultural stability, and an Earthgrid resonance that supports a harmonious infusion of Evolutionary Intelligence into the Earth and into ourselves. Acting from this place of equipoise with conscious deliberation makes possible safe passage through this precessional portal; it makes possible our graduation as a spiritually awakened world into galactic awareness and extraterrestrial co-participation.